Justin Townes Earle released one of my favourite albums of last year, and everything he’s put out so far has been excellent. Next year, he’ll be releasing a new album, Nothing Is Gonna Change The Way You Feel About Me Now, and has been road-testing some of the tracks on it on his European Tour. 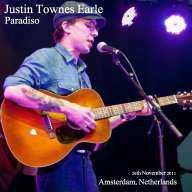 This show is from the Paradiso in Amsterdam, from 26th November 2011, and was recorded by a taper called scdegraaf.